Warsaw draws big crowds with its seemingly unstoppable energy, exemplified by the city's explosive nightlife and thriving music scene. Kick off your visit on the 14th (Fri): wander the streets of Nowy Swiat, take in nature's colorful creations at Lazienki Krolewskie w Warszawie, then brush up on your military savvy at Warsaw Rising Museum, then take a stroll around Old Town Market Square, and finally appreciate the extensive heritage of Old Town. To find ratings, where to stay, traveler tips, and tourist information, use the Warsaw itinerary planner. Reykjavik, Iceland to Warsaw is an approximately 8.5-hour flight. You can also do a combination of flight and train; or do a combination of car and ferry. The time zone changes from Greenwich Mean Time (GMT) to Central European Time (CET), which is usually a 1 hour difference. In December, plan for daily highs up to 5°C, and evening lows to 0°C. Finish your sightseeing early on the 14th (Fri) so you can take a train to Krakow. On the 15th (Sat), contemplate in the serene atmosphere at Wawel Cathedral, then steep yourself in history at Cloth Hall (Sukiennice), then take in the spiritual surroundings of St. Mary's Basilica, and finally wander the streets of Stare Miasto. On your second day here, view the masterpieces at Galleries Coco Art, wander the streets of Ulica Florianska, then appreciate the extensive heritage of Wawel Royal Castle, and finally examine the collection at Wieliczka Salt Mine. For photos, more things to do, and tourist information, you can read our Krakow road trip planning site . Traveling by train from Warsaw to Krakow takes 2.5 hours. Alternatively, you can do a combination of train and flight; or drive. In December, plan for daily highs up to 5°C, and evening lows to -2°C. Finish your sightseeing early on the 16th (Sun) so you can travel to Gdansk. On the 17th (Mon), stop by IVO&CO Galeria Bursztynu, then take a stroll through Mariacka Street (ulica Mariacka), then take a stroll through Old Town, and finally contemplate in the serene atmosphere at St. Mary's Church. 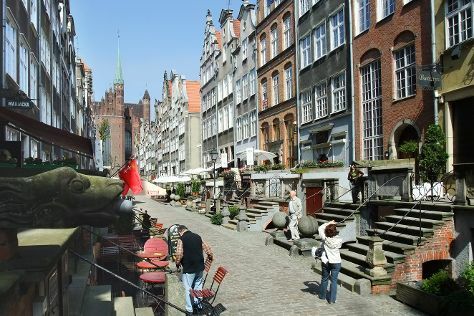 To find other places to visit, photos, maps, and other tourist information, use the Gdansk trip itinerary maker tool . Getting from Krakow to Gdansk by flight takes about 4 hours. Other options: take a train; or drive. In December, daytime highs in Gdansk are 3°C, while nighttime lows are -1°C. Cap off your sightseeing on the 17th (Mon) early enough to travel back home.